A good cup of coffee, a quiet house, over an hour of reading and reflection with an awareness of sharing it with God, a good (mentally stimulating) two hour breakfast and walk with a special girlfriend, a leisurely finish on the lawnmower touring the oneacrewoods. If nothing else goes right from here on out, it will still have been a great day. One full day of rain on the oneacrewoods has made it this luminescent shade of green – the color that is responsible for making green my favorite color. 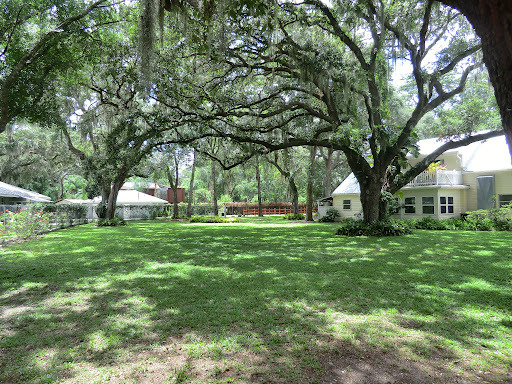 Our oak trees make this spacious canopy over the center of our back yard that is like a huge room with sunlight dapples all over the floor. To go back and forth, viewing it from all angles, seeing it’s freshly cut path behind me with all it’s glowing green-ness is like getting recharged and refreshed for me. And since everything was still damp there was no dust! I’m still flesh colored and recognizable. Today I’ll have to find some other way to get dirty. Your dad told me how you had "tailor made" your four day a week job, doing things the others didn't like to do as much. Good for you, because we all need time to do those Friday things (or whatever day we can do them).